At Duracell, we provide trusted power to those who depend on us to keep their lives charged. Duracell Coppertop Alkaline batteries are crafted and infused with triple corrosion protection for battery power you can count on. This eight-pack of high performance 1.5 volt batteries will last in storage for up to 10 years, so you can rest assured that they will be ready when you need them. 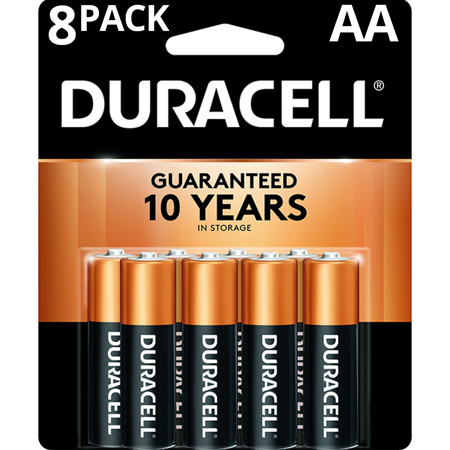 Duracell AA batteries provide long-lasting power to your everyday household devices such as toys, remote controls, flashlights, calculators, clocks and radios, portable electronics, wireless mice, keyboards, and more. Duracell is the #1 trusted battery brand, and we're proud to offer you Duracell 1.5 Volt Coppertop Alkaline AA batteries as part of Duracell’s trusted lineup of batteries. From the home to the car to your outdoor adventures, Duracell provides a variety of products to meet the personal power needs of our valued customers. Check out https://www.duracell.com/ for our full line of products, including multiple battery types and battery sizes, hearing aid batteries, rechargeable batteries and battery chargers, inverters and jumpstarters, auto batteries, marine batteries, solar landscape lighting, LED lighting, flashlights, keyless entry remotes, and more. Try Duracell CopperTop, Quantum, Rechargeable, Hearing Aid, Coin Button, and Specialty for all your battery needs. As part of our commitment to preserve the environment, we use only nontoxic inks in our packaging and the card portion of our package contains recycled material. DO – Keep all batteries in a safe place away from children and pets, particularly the smaller sized batteries. DON’T – Remove the battery label, or attempt to take the battery apart, or dispose of in a fire as this may lead to rupture and/or chemical burns. DO – Store batteries, in their original packaging, in a dry place and at normal room temperature until ready to use. DON’T – Attempt to recharge non-rechargeable batteries. This can cause your batteries to overheat or leak. DO – Use the correct size and type of battery specified by the manufacturer of your device. DON’T – Carry batteries loose in your pocket or purse as they may create a safety risk. They can be shorted by contact with metal objects and may leak, overheat or rupture. DO – Replace all used batteries in your device at the same time. Insert batteries properly, with the plus (+) and minus (–) terminals aligned correctly. CAUTION: Some equipment using more than three batteries may appear to work properly even if one battery is inserted incorrectly. DON’T – Mix old and new batteries, batteries of different brands, or batteries of different types (for example heavy duty zinc chloride batteries and alkaline batteries) in the same device as this may cause the batteries to leak. DO – Where possible, recycle your batteries where communities offer recycling or collection programs. You can contact your local government for information about the disposal options in your area. **Should your device be damaged due to a battery defect, when used as directed, we will repair or replace your device. See Duracell.com/guarantee for details. We purchase this product regularly.